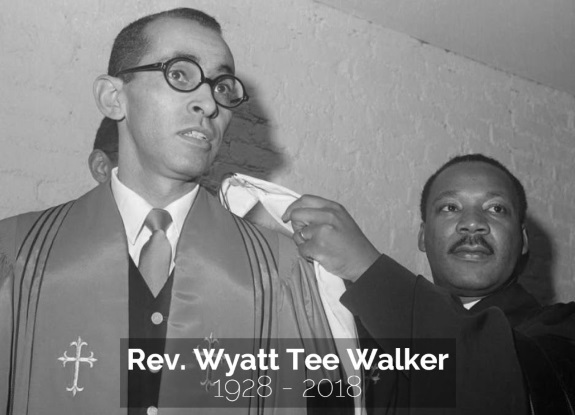 "Wyatt Tee Walker, a nationally renowned pastor, civil rights leader, and theologian who served as the chief of staff for Dr. Martin Luther King, Jr. passed away this week at the age of 89. Rev. Walker began his career of advocacy at the height of the Civil Rights Movement in organizations like the Congress of Racial Equality, National Association for the Advancement of Colored People, and the Southern Christian Leadership Conference, for which he served as the executive director. In 1967, Rev. Walker was called as the senior pastor at Canaan Baptist Church of Christ in Harlem, a position he held for 37 years. Even up until recent years, Rev. Walker continued to advocate for equality, opportunity, better schools, affordable housing, and a fairer world. 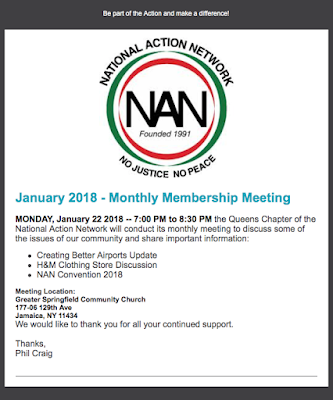 His legacy will live on in the generation of activists who were inspired by his absolute dedication to the causes of justice. " 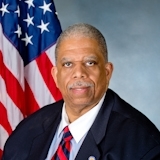 NYS Senator Leroy Comrie. 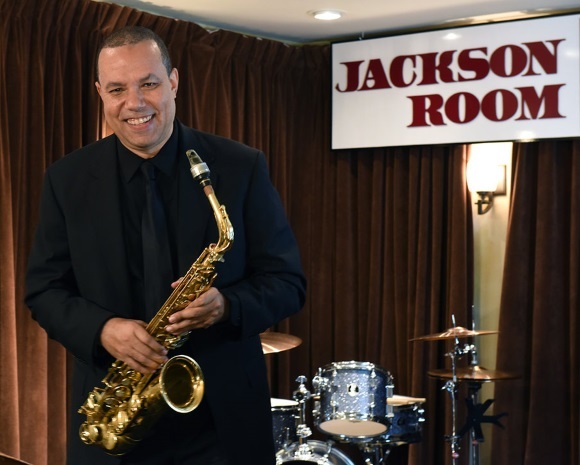 The Month's End performance at Jackson Room, will feature the Willie Martinez Quartet. Ed Jackson, the Jackson Room club owner stated "We've had a colder January than usual and we're looking to Willie Martinez and his hot Latin jazz sets to help warm us up!" Willie always brings a synthesis of jazz infused with hot Latin beats and rhythms. Jackson conveyed "I'm honored to be the special featured saxophonist with the Willie Martinez Quartet that night." If this promising performance is anything like Willie's past performances your heart and soul will be set ablaze with cultural musical artistry January, 27th, 2018, so don't miss - "End January With Hot Latin Jazz!" If you are an artist, author, baker, crafter, designer, product maker, etc. then the Artist Market On Linden is waiting for you. From Student to instructor, newbie to professional, from individuals to groups, from inventors to poets, & performers, the studio at Innovations In Creative Arts is always open and ready to help you expand your customer base, launch your work or products, and try out new ideas -- close to home. All types of creatives, schools, non-profit organizations, and service businesses are welcomed as well. Whether you sell online, at work, or by traveling around the city to various events, you should always have a home base in your own community. Our creative space hosts The Artist Market On Linden every 1st Saturday and on special occasions. With more than 15 vendors who largely make their own items, the studio is transformed into a true Artist Market where creatives can sell, take pre- and custom orders, and enjoy meeting and greeting old customers while meeting new shoppers. The studio is also available for launchings, meetings, showings, and celebratory parties. Looking for a space to hold an event, performance, open mic night? Innovations In Creative Arts is here for you. Labels: Shop locally support the arts! Shop at The Artist Market on Linden. 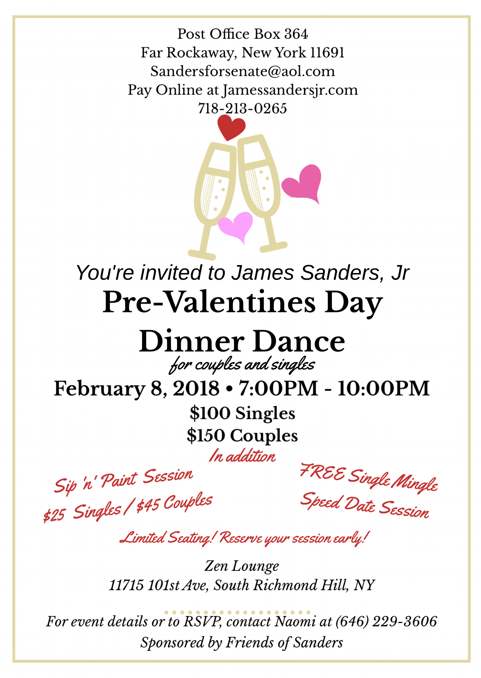 The Friends of Sanders invites one and all to a Pre-Valentines Day Dinner Dance for couples and singles. Join them for a night of romance, wine, all things lovely and divine at their Pre-Valentine’s Day Dinner Dance. 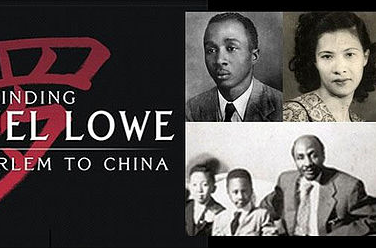 Three successful black siblings from Harlem discover their heritage while searching for clues about their long-lost grandfather, Samuel Lowe. Their emotional journey spans from Toronto to Jamaica to China, reuniting them with hundreds of Chinese relatives they never imagined existed. Labels: The Friends of Sanders invites one and all to a Pre-Valentines Day Dinner Dance for couples and singles. Freestyle Fever with George Lamond, Judy Torres, Cynthia, Johnny O, Coro, Pretty Poison, Noel, Rockel and more. Labels: Freestyle Fever with George Lamond. 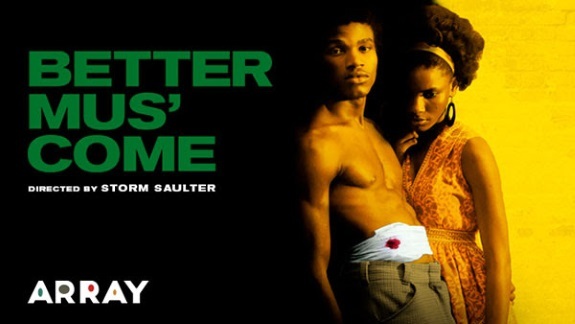 "The new benchmark in Jamaican film making" -- Jamaica Gleaner "A gorgeous (if at times overripe) melodrama set during the deadly political unrest of late-'70s Jamaica" -- Village Voice. Another new addition from Ava DuVernary's ARRAY library, passion, politics and poverty collide as this stunning love story from Jamaican writer/director Storm Saulter unfolds against a backdrop of political turmoil. Three years in the making, Better Mus' Come brilliantly captures the deep rooted conflict at the heart of Jamaican politics as seen in violent images in news reports and recent explosive political headlines all over the world in the international manhunt for alleged Jamaican "Don", Christopher "Dudus" Coke, leaving 76 civilians dead and a government-mandated State of Emergency in its aftermath. Nationwide As Cruise Planners travel agents and franchise owners, Carlos and Renee Boozer operate a full-service land and cruise travel agency based in the North Las Vegas area and specialize in cruises, land vacations, and tour vacations for a wide variety of clients: individual travel, group travel, non-profit organizations, family or high school reunions, meetings and corporate incentive travel, and weddings and honeymoons. 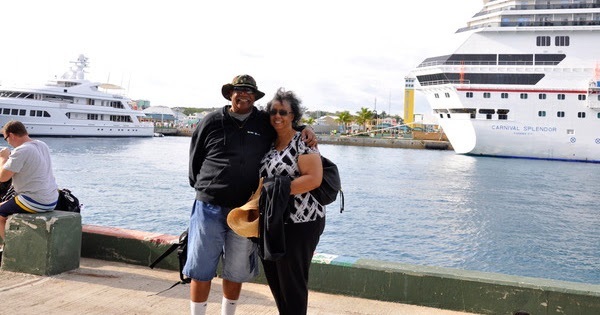 Labels: AWARD-WINNING BLACK-OWNED CRUISE PLANNING AGENCY OFFERS SUPERIOR SERVICE AND EXPERTISE FOR TRAVELERS. Los Angeles, CA -- Following its record premiere ratings on OWN: Oprah Winfrey Network last summer, UMC - Urban Movie Channel, the first premium subscription streaming service created for fans of African American and urban content, is excited to announce that it has acquired exclusive SVOD rights for the popular docuseries, Black Love. Created by newlywed filmmakers Codie Elaine Oliver and Tommy Oliver (The Perfect Guy) and Confluential Films, Black Love highlights love stories from the black community and seeks to answer the burning question, "What does it take to make a marriage or relationship work?" Featured couples include Viola Davis and Julius Tennon, Meagan Good and DeVon Franklin, and Tia Mowry and Cory Hardrict. Labels: UMC - URBAN MOVIE CHANNEL NABS EXCLUSIVE SVOD RIGHTS FOR OWN'S "BLACK LOVE" DOCUSERIES. 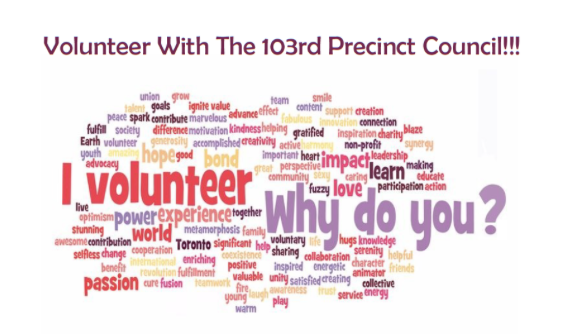 Do you live with the confines of the 103rd Precinct? 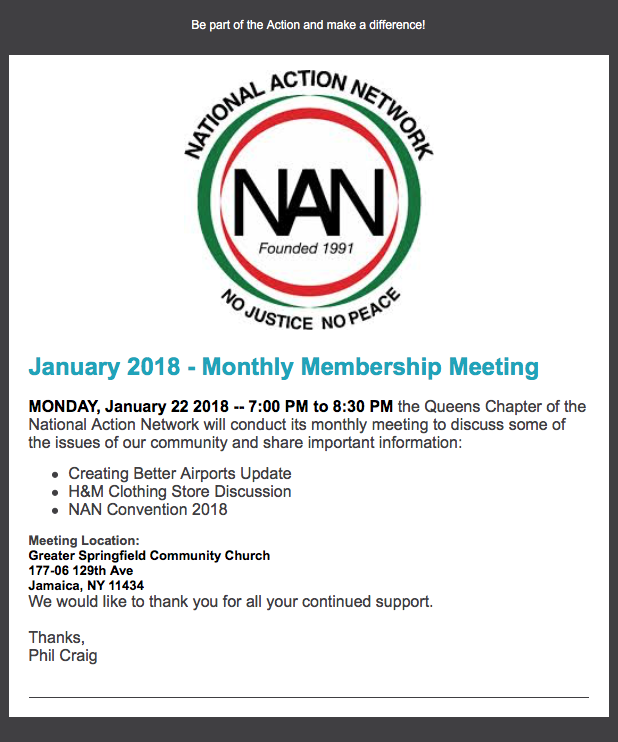 Are you concerned about the safety/security of yourself/neighbors? Labels: Are you concerned about the safety/security of yourself/neighbors? If it’s Tuesday afternoon, then its movie time at the Central Branch of the Queens Library. Today’s feature is “Taken”. 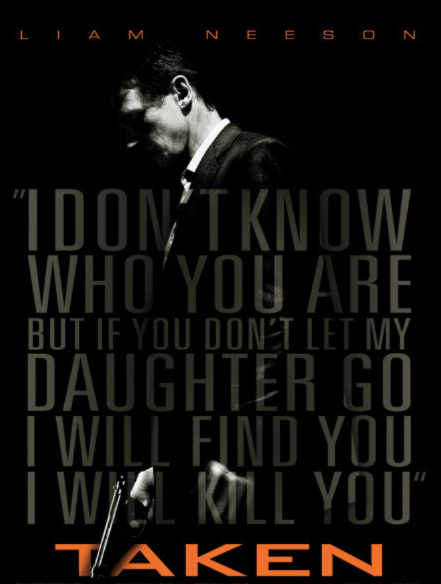 A retired CIA agent travels across Europe and relies on his old skills to save his estranged daughter, who has been kidnapped while on a trip to Paris. Labels: If it’s Tuesday afternoon, then its movie time at the Central Branch of the Queens Library. 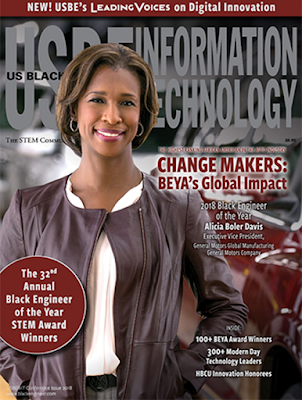 Baltimore, MD US Black Engineer (USBE) magazine's annual BEYA STEM Conference will recognize GM Executive Vice President, Global Manufacturing Alicia Boler Davis with the Black Engineer of the Year Award on Saturday, Feb. 10, 2018, at the BEYA Gala in Washington Marriott Wardman Park in Washington, DC. Labels: AVIS SELECTED 2018 BLACK ENGINEER OF THE YEAR. Thinking about starting a business as a youth these days reaches farther into the creative realm than a lemonade stand or mowing lawns. Children today are discovering ways to educate and make a difference in how the story is told and sold. 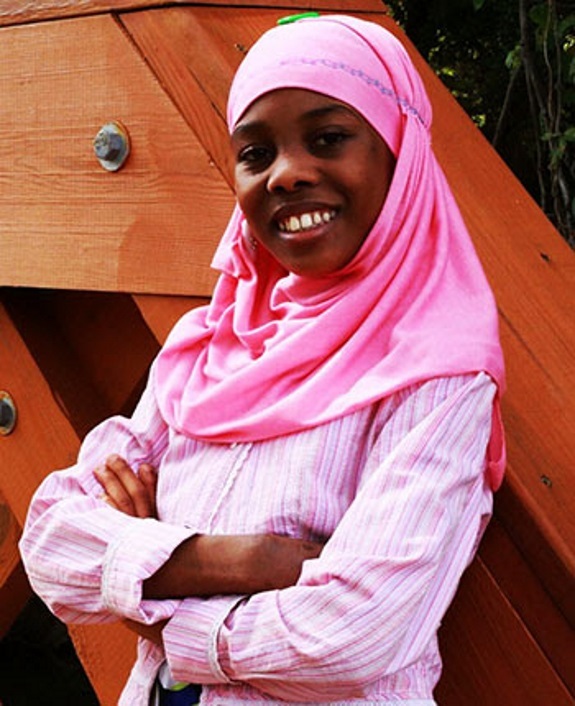 Meet Kalimah McKeaver, 13, founder & CEO of Dinkra Stylez, LLC and The Kid Griot. Dinkra Stylez is the world’s first craft design firm with the mission of educating its clients about African Heritage through the creation of fun, colorful, and engaging products. Labels: 13-YEAR OLD ENTREPRENEUR TURNS EDUCATION ABOUT AFRICAN HERITAGE INTO AN ARTS & CRAFTS BUSINESS. Farmington Hills, MI Nursing Assistant classes are available in the metro Detroit area. Excelling Nursing Academy offers a two week course, operating Monday through Saturday from 4pm to 10:30pm. 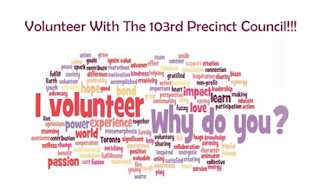 Tuition assistance and childcare is provided to those who qualify. 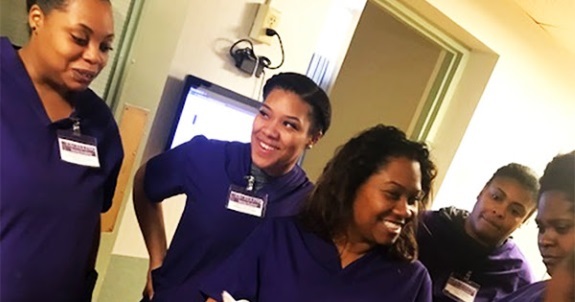 Labels: BLACK-OWNED NURSING ACADEMY OFFERS NURSING ASSISTANT CLASSES FOR STUDENTS WHO WANT TO BUILD A CAREER IN HEALTH.